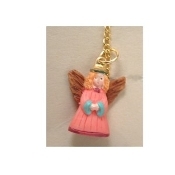 ANGEL PENDANT NECKLACE - Christian Faith Charm Jewelry Jewelry - Tiny PINK Resin Dimensional Charm. Approx. 7/8" on 18" Gold-tone Neck Chain with safety clasp.